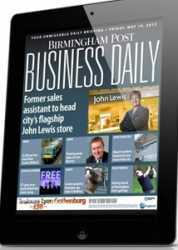 The Birmingham Post has launched a tablet edition called Business Daily. Its publisher, Trinity Mirror, believes it to be the first of its kind. It will publish 30 pages every weekday and carry content, says editor Stacy Barnfield, “completely different from the Birmingham Post’s print edition. The Post has been published once a week, every Thursday, since November 2009. Barnfield tells readers that Business Daily will include five pages of “leads and deals” – a round-up of mergers, acquisitions, planning applications and contract offers. Individual subscribers must pay £9.99 a month for access to the app, which works on both Apple and Android devices. Corporate subscribers will have special rates dependent on the numbers of users.